Can enthusiasm for virtual reality be converted into learning gains? That was the topic of a research project at Cornell University, which recently pitted VR against hands-on and computer-based activities. The bottom line: Researchers found students learned equally well in all three modes. For the experiment, the university's Virtual Embodiment Lab in the Department of Communication worked with people in the Astronomy program to come up with a way to teach physics. Every student was given a pre-test with 14 questions to measure their understanding of Moon phases, the specific lesson used in the study. Then the participants were randomly assigned into one of three groups and given basic verbal instructions for how to proceed. The first group, 59 students, used a traditional hands-on approach: A bright light represented the sun; the participant was the Earth; and he or she held a short stick with a ball on top, representing the Moon. As a paper on the project explained, "If the participant holds the ball constantly at arm's length and spins around, this symbolic Sun-Earth-Moon system mimics the illumination pattern of the Moon phases so they can be viewed with the control of the participant." A second group, with 57 people, worked on a desktop computer with a simulated version of the activity, in which students saw visualizations of the Sun, Earth and Moon and could use keys on the computer to move forward and backward in time. They could also change the position from which they were viewing the images to get varying perspectives on the Moon's shadows as it orbited the Earth and the Earth orbited the Sun. A third group, with 56 participants, ran a VR activity with an Oculus Rift headset and two hand controllers running a simulation made using the Unity VR game engine. The structure of the activity was similar to the desktop version, except that participants used the hand controllers to move forward or backward in time. They could also use a cursor, virtually attached to their hand, to reach out and "grab" the Moon to drag it forward or backward in its orbit. The students were initially placed in space above Earth's North Pole, but could relocate to other viewing positions. The VR and desktop activities, which were designed by a team of graduate and undergraduate students in communication, computer science and astronomy, included accurate star maps and relative motions of the celestial bodies. Following the activity, the research subjects were asked another set of questions matched to the content, as well as demographic details and learning preferences. In order for the researchers to look at different kinds of learning, the "test" questions were mixed among those that used rote memorization and others that required building of mental models and making predictions. After they were finished with their activities, participants were shown the other two forms of learning. More than three-quarters of the students (78 percent) said that they would prefer the VR activity over the other choices. Their reasoning: In general, by allowing users to easily change the environment on their own, VR provided a "full picture," which helped them build their "mental model." Among those who didn't prefer VR, the overall sense was that they were uncomfortable or distracted "with the overwhelming sensory input," including the use of the controls. 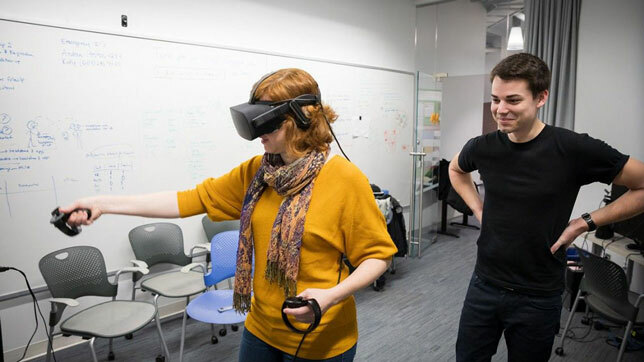 "The similarity in learning outcome is particularly interesting, given that the VR participants had to learn how to use new technology at the same time they were learning the moon phases," said lead author Jack Madden, a doctoral candidate in the field of astronomy, in an article about the project. "What would the outcome have been if they'd already been familiar with using VR to learn?" The paper, "Virtual Reality as a Teaching Tool for Moon Phases and Beyond," was presented at the Physics Education Research Conference last August and published in the peer-reviewed 2018 Physics Education Research Conference Proceedings. According to fellow contributor Swati Pandita, a Ph.D. student in the Virtual Embodiment Lab, future research will explore how the use of avatars influences learning outcomes. "Several participants mentioned feeling nervous because they didn't have a body and remarked, 'There's no space suit so how can I breathe?'" she explained. "The lack of a virtual body may have affected their willingness to explore the environment freely. We want to see if people will feel more encouraged to move around and engage more with the environment if they have an avatar." The research received support from Oculus's education division.